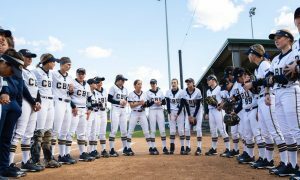 The DI College softball teams are well into conference play all across the country. Below are five things that stood out to us at FPN, that you may have missed from Saturday play. The seventh-ranked Florida softball team secured the series sweep of No. 11 South Carolina with a pair of shutouts, 7-0 & 3-0, at Katie Seashole Pressly Stadium Saturday afternoon. Aleshia Ocasio (15-5) and Kelly Barnhill (19-1) led the Gators (37-7, 12-3 SEC) to the pair of victories with dominant pitching performances. Ocasio allowed only two hits in game one, while Barnhill limited the Gamecocks (34-10, 8-7 SEC) to just one hit in the finale. The pair combined for 18 strikeouts on the day. Senior Nicole DeWitt secured the series sweep with a walk-off three-run home run in the bottom of the seventh inning of game two. It was the 10th home run of the season for the Garden Grove, Calif. native. Next up for Florida is a solo midweek contest against Florida A&M Wednesday, April 18, at 6 p.m.
Fresno State defeated San Jose State 8-2 on Saturday at Mission College in Santa Clara. Fresno State (26-15, 9-2 MW) won its ninth consecutive game and extended its lead over San Jose State (25-13, 9-4 MW) atop the Mountain West standings. The Bulldogs have won each of their first four MW series and have outscored their league opponents 77-25. Making her first start since March 2, Samantha Mejia allowed just one earned run in the complete game victory on Saturday. With the win, Mejia improves to 4-0 in MW play with a 0.35 ERA in 20 innings pitched. On the offensive side, five different Bulldogs recorded two hits in the contest. Fresno State will look for its second consecutive MW series sweep and 10th straight win overall in the finale against San Jose State on Sunday at noon. 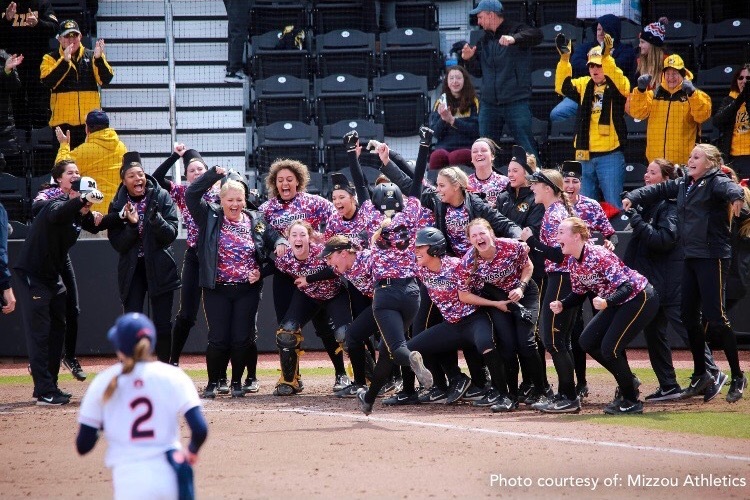 The Mizzou Softball team (24-21, 6-11 SEC) clinched its first Southeastern Conference series win on Saturday, defeating No. 13 Auburn in back to back contests. The day started with concluding Friday evening’s suspended game and Mizzou facing a 4-1 deficit heading to its final at bat. Trenity Edwards delivered a game-tying pinch hit three-run home run, followed by a walk-off home run from Cayla Kessinger. 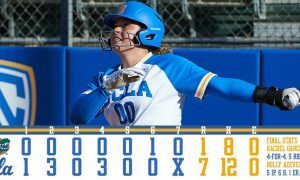 The two-out solo home run to left was Kessinger’s second of the day, marking her first career multi-home run contest. In game two, Lauren Rice took control in the circle and posted her seventh complete game this year. The Morrison, Illinois, native’s gem marked her third complete game victory in SEC play this season. Mizzou and Auburn conclude their weekend series Sunday afternoon with first pitch scheduled for noon CT. The No. 8 Texas A&M softball rallied to defeat No. 23 Kentucky, 4-3, on a walk-off single from Kaitlyn Alderink Saturday afternoon at the Aggie Softball Complex. Trailing 3-2 in the bottom of the sixth, Texas A&M’s (36-9, 9-5 SEC) Erica Russell tied the game with a RBI single to center, before Alderink provided the late-game heroics in the seventh with a two-out walk-off single to left center, scoring Sarah Hudek. Lexi Smith earned the seventh win of her senior campaign as she held Kentucky (25-13, 3-10 SEC) to four hits and only allowed two walks while recording a season high 10 strikeouts in 5.1 innings of relief. Kayla Poynter threw the first 1.2 innings of the game as she allowed four hits and struck out two. 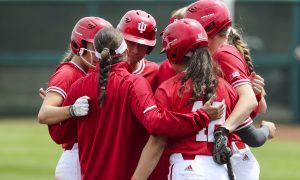 The Aggies will go for the sweep against Kentucky on Sunday at 2 p.m.
Indiana Softball’s bats continued to stay hot as the Hoosiers secured the series sweep of Maryland on Saturday, taking both games of the doubleheader, 9-3 and 9-1. Combined with Friday’s 10-1 victory, the Hoosiers outscored the Terrapins in the three-game set, 28-5. With the wins, Indiana has now swept three of its first four Big Ten opponents this season, the most sweeps in a single year for the program since 2011. The Hoosiers improved to 10-2 in conference play, staying in second place in the conference standings. Indiana returns to Andy Mohr Field on Wednesday as the Hoosiers host Louisville at 5 p.m.